It is a gift to humanity and a puzzle to scientists. A “gift” because, next to garlic, it has more health benefits than any other food/herb on earth with over 3000 scientific studies to support its use in preventing and reversing many common health ailments. A “puzzle” because it simultaneously heats and cools, rewards and torments. “It” is cayenne pepper, the most widely studied and easily available of the many hot chili peppers on earth. Some people love it and some people hate it, but everyone has to respect the impact that this humble little fruit, cayenne, has had on the history of mankind. It has been used as a weapon, a food, a spice, and an herbal medicine for over 9000 years. Chili peppers, including cayenne, are consumed regularly by over 1.5 billion people each day, or 25% of the world’s population, which makes it one of the most popular foods in the world. 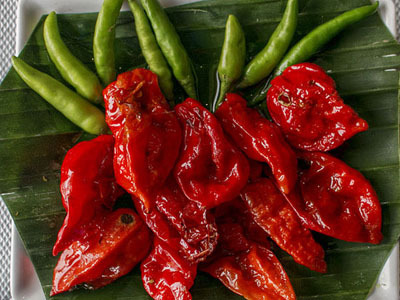 Chili peppers, also spelled as “chile” or “chilli”, may well be the first cultivated food when our “hunter gatherer” ancestors decided to settle down to farming. The list of ailments that can be improved with the use of cayenne boggles the imagination. From asthma to pain reduction to melting away pounds to preventing heart disease; there are only a handful of “superherbs” on the planet earth that can match cayenne for its versatility, taste, therapeutic value and safety. How can it cool you and warm you at the same time? How can it feel like its burning, but actually reduces the pain from burns? How can it hurt so bad when the amateur eats it, yet it helps the body to generate an internal form of morphine-like pleasure? How can it be so selectively good for your body cells while it is viciously lethal to intestinal bacteria and parasite cells?